Do you﻿﻿ want to win awesome stuff? Throughout the year, we'll have numerous chances for you to win prizes. This is your one-stop-shop to stay up-to-date on all of the current and upcoming ways to WIN! All you have to do is "Like" or "Follow Us" on social media. We're always randomly selecting winners! The links can be found at the top and bottom of this page. All over campus during the first two weeks of September, you'll be able to search for SkidNorms Sweepstakes tickets. Each ticket has a unique PIN number. To be eligible to win prizes, you'll have to submit your PIN number using the form on the SkidNorms Sweepstakes page or by clicking here. You can submit up to 5 PIN numbers. The deadline to submit your information is 8pm on September 13, 2015. Visit us at the Health Fair for your chance to win instant prizes! Visit our booth at Club Fair and enter the raffle! This event was SUPER popular last year. We'll be hiding over 100 mini plush horses all over campus. We'll drop hints about their location via social media and posters around campus. Each horse has a number attached to it. ​Bring the horse to the Wellness Center (3rd Fl., Case Center) during the following hours to claim your prize: Monday, Wednesday, Thursday or Friday 12pm-3pm or Tuesday 1pm-3pm. The picture to the right shows a clue we sent out last year. 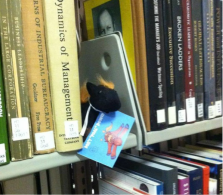 The person who found it looked up the location of the "Dynamics of Management" book in the library to find it! You don't want to miss this!! Details to come soon! STAY TUNED FOR ADDITIONAL WAYS TO WIN!